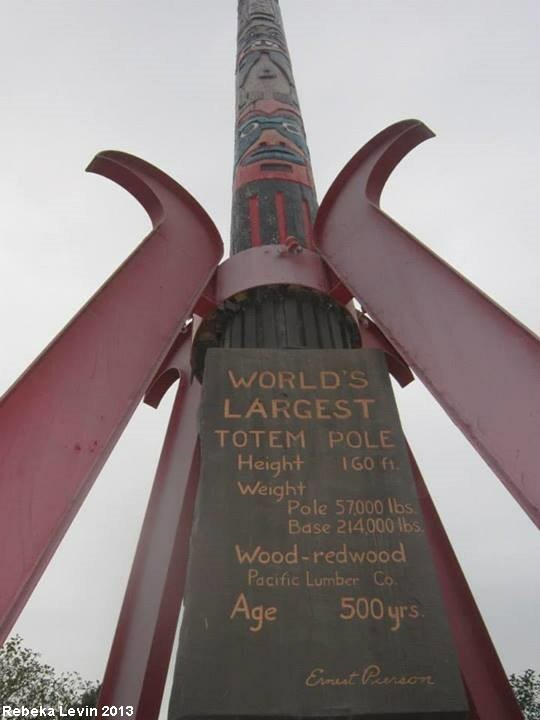 Carved from a single 500 year old redwood, the World's Largest Totem Pole stands 160 feet tall and weighs 57,000 pounds. The base that holds it up clocks in at 214,000 pounds. Designed in 1962 by Ernest Pierson with the help of Johnny Nelson it was erected to celebrate the opening of the McKinleyville Shopping Center. The top of the totem pole has a thunderbird on it with a wingspan of twelve feet. The right eye is actually a hole in the log and birds have been seen flying in and out of it. Below the thunderbird is a red headed woodpecker, a coyote, a blue jay, a frog, a crow, a beaver, an owl, a grizzly bear, and finally an unknown mysterious face. In 1984 due to the wood suffering from rot, the totem pole was taken down and fixed up. The carvings were redone and an antenna was attached to the top. After the antenna fell over, the entire totem pole was surveyed again in 1999. 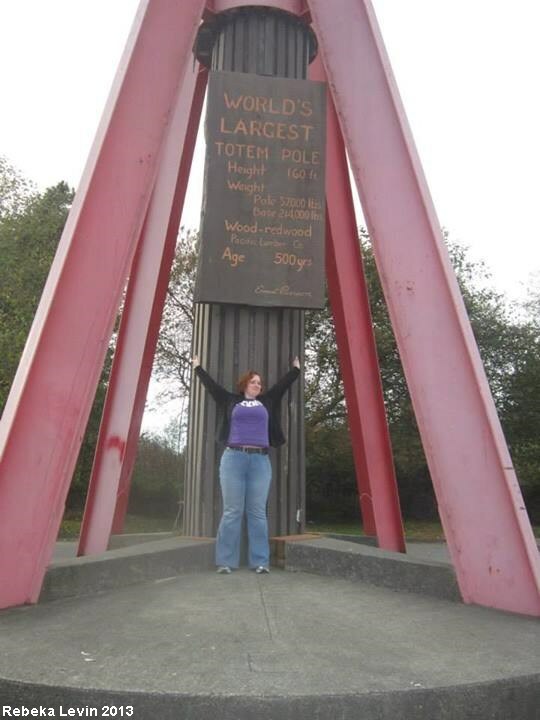 The actual wooden pole came in at 144 feet and 8 inches. 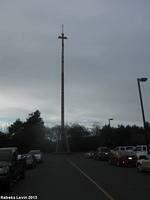 With the antenna on top it is 159 feet 5 1/2 inches. This makes it the tallest totem pole carved from a single log and it is also the largest totem pole in the world. Foyil, Oklahoma - at sixty feet tall and thirty feet wide, this is the World's Largest Concrete Totem Pole. All three pictures courtesy of Rebeka Levin. You have the tallest totem pole. Shingletown has the best looking totem pole in the world. The Animal Council Totem Pole. When viewing the McKinleyville Totem Pole, you get to admire the work of two artists - Ernest Pierson, who carved the pole, and Duane Flatmo, who repainted the pole in 1998-99. Flatmo is a Humboldt County, Calif. artists well-known for his murals and quirky artwork, as well as his kinetic sculptures, which you can see in Humboldt's famous Kinetic Sculpture Race every May. Flatmo gave the McKinleyville Totem Pole much more vibrant colors and a unique design. It's worth looking at the Totem Pole from various angles and under different lighting conditions. Use binoculars to watch birds hanging out at the top. Some people make the mistake of judging the totem pole as if it's supposed to be somehow authentic from a Native American point of view. It's not. It's a piece of interesting folk art. 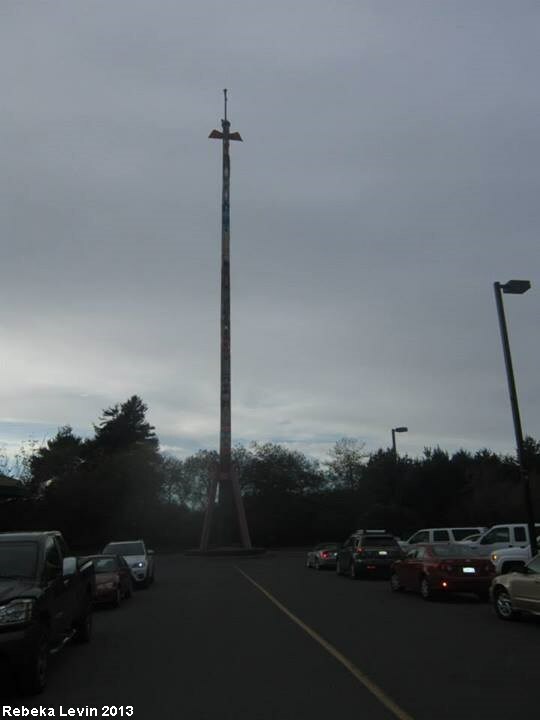 The Totem Pole is at the McKinleyville Shopping Center, so you can combine seeing this site with stocking up on food, beverages and other supplies. Having lived up there much of my life I can tell you that if you plan to make a special visit to see the pole you will be a bit disappointed. It's neat and all, worth looking at for about 3 minutes but there are 1,000 amazing places up there that I would visit first. Rich in history, beautiful nature spots and steeped in Indian traditions... make sure to swing by the pole but check out everything else first.